A palette of fresh, confident colours moves our house look beyond summer’s conventional pastels into a richer, more masculine space. The quintessential pairing of sky blue and pink is threaded through the collection’s casual and formalwear, grounded by touches of classic sporting colours; polo red, racing green and buttercup yellow. The result is clothing that feels playful yet sophisticated. Tailoring is grounded in timeless shades of English navy, beige and tan, with touches of complementary copper and khaki in knitwear and accessories. Casualwear is similarly sporty. Relaxed block stripes in light colours reference the uniforms of British horse racing, polo and rugby teams, and this season sees luxurious long sleeved crewnecks and polo shirts layered beneath lightweight jackets with an aristocratic bearing. The cricket jumper has also been revisited, realised in a cream chunky-knit with playful pink borders along the neckline and hem. This season’s bombers and blousons reference athletic windbreaker jackets in treated cotton and lightweight technical fabrics. Alongside these, classic macs and trenchcoats in neutral cottons, practical tailored chinos and finely striped summer T-shirts round out the collection. 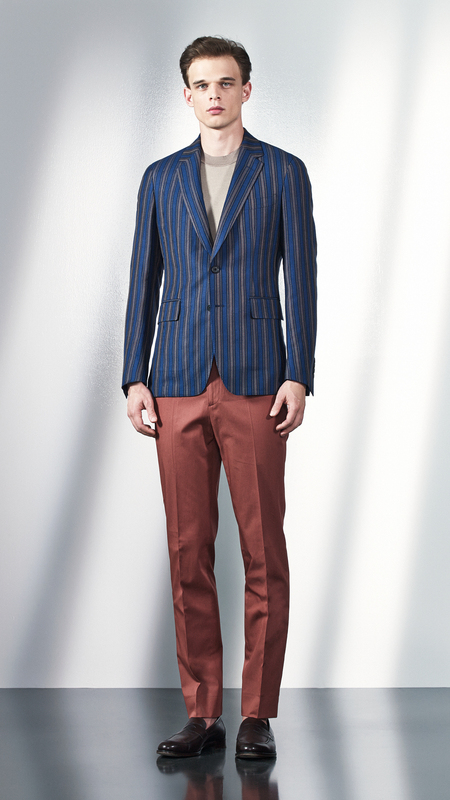 The subtle monogram patterns on chinos, polos and knitwear is yet another a subtle nod to classic English sportswear. Eveningwear is particularly playful and has received the same treatment as our suiting. Silk jacquard smoking jackets in blue and bronze are paired with linen dress trousers and simple fine-gauge knits for a breezy look that hints at the dress codes of post-match champagne receptions and garden parties. As always, the Spring Summer ‘18 collection has been designed to fulfil every need of the Gieves customer. Whether sharp business suiting, sporty weekendwear or chic evening dress, this season the house has drawn upon a distinguished British aesthetic and contemporised it for today’s international, style conscious man. Headquartered at No.1 Savile Row Gieves & Hawkes is a global destination for the very best menswear, from legendary Bespoke tailoring to exceptional ready-to-wear collections featuring sophisticated separates and sportswear and immaculate business suiting. With roots planted firmly in a military tailoring tradition, Gieves & Hawkes has over 245 years of trading history and has counted every British Monarch since George III among an esteemed list of patrons. This list has featured a legion of noteworthy and influential gentlemen since the 18th Century and continues into the 21st. The company proudly holds all three British Royal Warrants and is honoured to serve several other Royal households around the world along with statesmen, business leaders, sports legends and global stars of stage and screen. The Gieves & Hawkes brand is infused with Aristocratic, Royal and Political heritage and timeless style which resonates internationally. The beating heart of this rich provenance is our commitment to handmade, Bespoke tailoring and the associated craft and an unyielding commitment to quality. Masculine and considered, Gieves & Hawkes aesthetic is at once British and international and represents the very best in timeless men’s style.